Stumbles & Stitches: Guest Post on Whip Up! This original piece is listed in my shop now! I am offering a 15% discount off your first purchase with the discount code LAUNCH11 (visit my site here for details). Go on over to Whip Up to check out the tutorial and make your own burlap art. Thank you Kathreen for inviting Stumbles & Stitches to participate! Update: I noticed the links to the template aren't working on the Whip Up post and Kathreen is currently traveling. So here is the template (PDF). Make sure and come back this week, Angel will be posting her version of this project! Can't wait to see what she came up with. 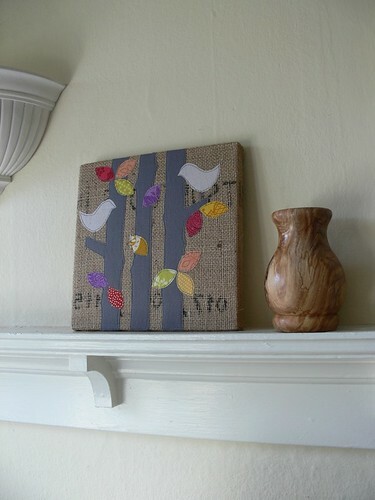 Also, if you have photos of your own burlap wall art to share, please post them in our Flickr pool, we'd love to see. If you're a new friend visiting our blog for the first time, a big welcome!! We hope you'll stick around, browse and come back. Jump in and join the crafty conversation! You can also subscribe to the RSS, "like" us on Facebook and follow us on Twitter. 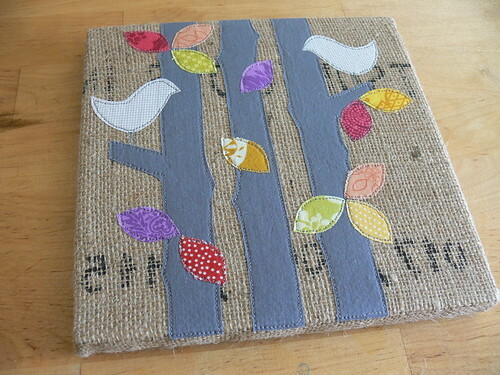 very cool jenny!i just love this burlap work you are doing! Fantastic tutorial at Whip Up, totally easy to follow, even *I* could do it! I'm using your bird template to make more felt Christmas ornaments - you're addicted to burlap, I'm addicted to felt! Congrats on your feature!